So, what types of things should you ask your readers and how? There are generally two categories of questions to ask your readers: ones that help you get to know them better and opinion questions that help make readers feel more part of the process (and also help your author business). In terms of getting to know your readers, you can ask them things like their favorite genres to read. While you may be an author they’ve purchased, their absolute favorite genre may be one that’s adjacent to your own. Perhaps you write contemporary romance books, but a decent number of your readers are huge fans of shifter romance books. While your actual book sales can give you a sense of who is buying, it could be possible that the people who subscribe to your newsletter align perfectly or their favorites are your genre plus one two additional ones. This information can be useful if you’re interested in writing in other genres, or if you do cross-promotion with other authors. Now that we’ve looked at some things you can ask, on to the how. Generally, I’d recommend a survey/poll. Something that’s multiple choice, though occasionally, with a fill-in-the-blank option. While there are multiple tools out there for doing surveys, I really like Google Forms. They’re FREE and they compile the results into easy-to-read charts. With Google Forms, you can also export the data into a spreadsheet when you’re done. You can either link to the Google form or embed it into your email (this article explains how to embed the survey into your email). 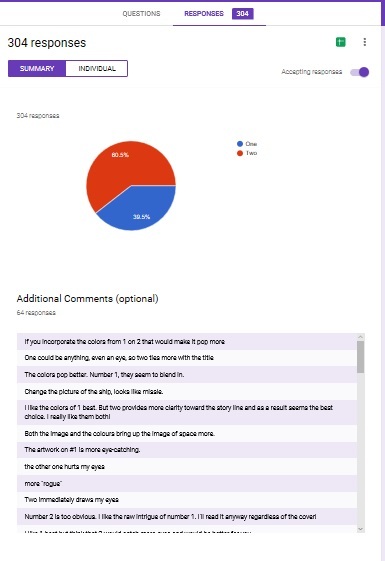 Below is a picture of a survey I sent out last year. I’d written a story that appeared in a limited-time anthology. Because the anthology had ended, I was free to use the story elsewhere. I decided to use it as a free gift to readers signing up for my newsletter. Because it had been in an anthology, it didn’t have a cover of its own (just the anthology covers). Earlier, I’d bought a pre-made cover for it, but later saw another pre-made I liked, and bought it, too. 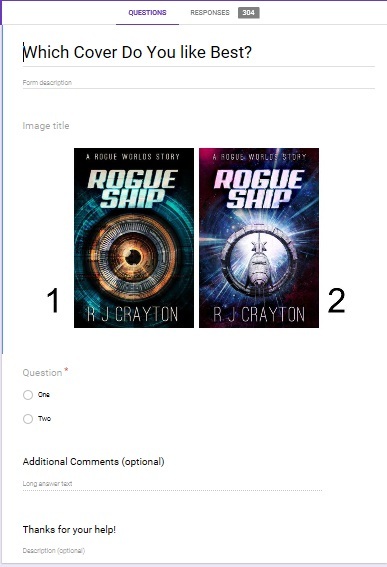 With two covers and one story and not a lot at stake (as it was going to be offered as a reader freebie for joining the mailing list), I decided to ask readers which cover they liked better and go with whatever the result was. I labeled the covers as one and two and uploaded the pic to the Google form. Then I asked which cover the readers liked better and also left the option to add a comment on why (if they wanted to). When the poll closed, it had 304 responses to the multiple choice and a few dozen people who were kind enough to leave comments on why they’d made their pic. Google gave me this handy dandy summary info. As I said earlier, I use Google Forms because it’s free and easy, but you can use whatever survey form you’d like. Whenever you send a poll, tell readers how long the poll will be accessible. I usually leave polls up a day or two longer than the date I’ve given as my cut off. Some people will forget, or stumble across the email later, so I like to give it an extra day or so for those stragglers. However, that’s me. You can be totally literal and cut it off at midnight on the date you tell people. Once you close the survey (so it stops accepting responses), send readers the results within a couple of days. So, if you put a poll up on Monday, and tell readers it will be available through Friday, you should try to send the results out no later than the following Monday. Readers like being asked their opinion and like knowing the results. So, if you had a poll asking which title people liked best, then send out the results soon, and go with that title. One thing about asking questions about what readers like best: If you’re going to ignore the advice, it’s best to just make your own decision and not involve readers. If your survey is more general about readers, still give the readers a taste of the info. For example, if you did a survey to find out who the readers are, or what their favorite genres are, report back the results. Say, “your fellow readers like urban fantasy and, oddly enough, space opera” or whatever your results show. Readers get a sense of community if they know what other subscribers like, and they feel more invested in books when they help with decisions. While my examples of a cover or a title are bigger decisions, you can ask for reader help on smaller things, like tag lines or ad copy or even a minor character’s name. You can even ask questions not related to your book. One newsletter I get had mentioned a news article discussing a possible Felicity (the late 90s TV show) reunion. The author said she had always been a fan of Noel, not Ben (both were Felicity’s suitors). Then she asked if people were team Ben or team Noel. So, unrelated yet fun stuff can be polled too. Have you ever surveyed your newsletter readers? What kinds of things do you ask about? Great idea! Thanks for sharing, RJ. Next Next post: Which “Peachy” Flash Fiction Story Gets Your Vote?